NCCAP standards are based on over 3 decades of experience educating, training and certifying over 150,000 individuals. Our standards are designed to ensure we meet Federal and State requirements and deliver person-centered care. Based on the social model of care, our certifications focus on activities, engagement and life enrichment that ensures the highest quality of life across the continuum of care. 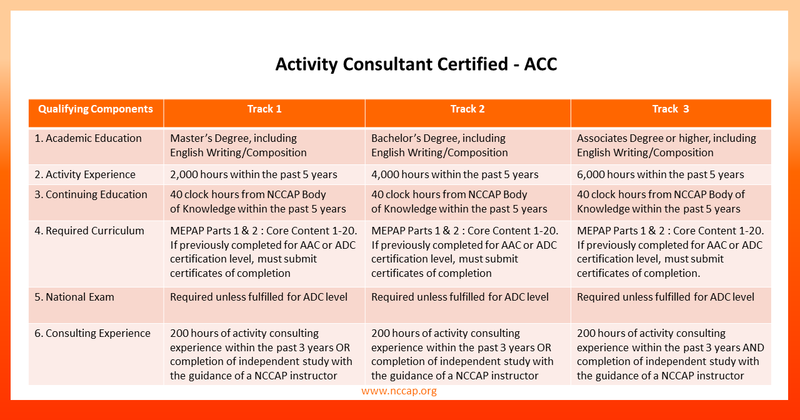 NCCAP offers 3 levels of certification: 1. Activity Professional Certified (APC), 2. 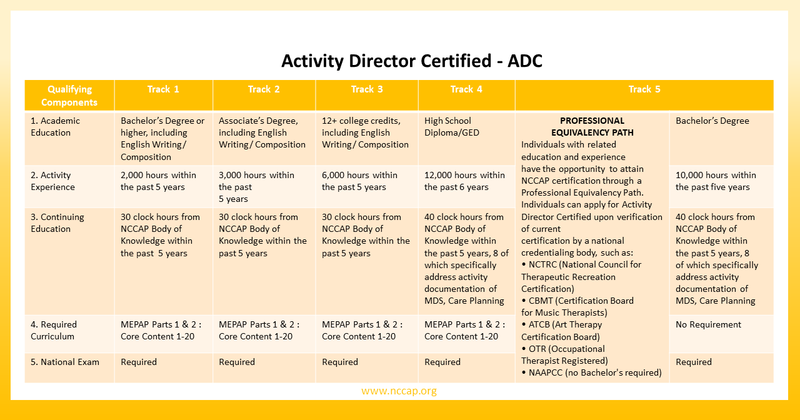 Activity Director Certified (ADC) and 3. Activity Consultant Certified (ACC). 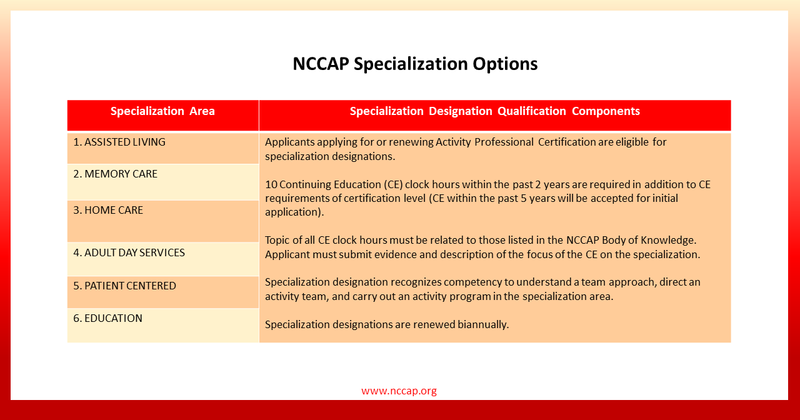 Individuals with NCCAP certification can also earn a Specialization in a number of areas by meeting Continuing Education (CE) requirements. Initial applications take 4-6 weeks to review, process and approve. Note: additional $25 fee for faxed applications. Note: Starting 1/1/2019 Activity Assistant Certified Provisional (AACP) certification is no longer offered by NCCAP and Activity Assistant Certified (AAC) certification is changed to Activity Professional Certified (APC) certification. Anyone who earned AACP prior to 1/1/2019 still has up to the 4-year time-frame to complete the necessary requirements to earn APC. The ADCP certification is valid for 6 years, must be renewed every 2 years with 30 CEs. You can only renew your certification using the link in the Email Renewal Notification to log-in and renew online. NCCAP sends the Email Renewal Notification to the email we have on record for you in your online profile. If you did not receive an Email Renewal Notification, please call the NCCAP Office to verify your correct email. If you did not yet create an online profile, please call the NCCAP Office and you will be guided to create one. Please note that Email Renewal Notifications are sent monthly starting 4 months prior to your expiration date. You can renew at any time during these 4 months, though your renewal date always stays the same. If you renew after your expiration date you will be charged a $55 LATE FEE. every year. Late renewal and payment date do NOT change the one-year period. To renew, acquire continuing education during the year after initial certification and each year thereafter. 4. Renewal email reminders will be sent 90 days prior to expiration and then monthly thereafter. 5. Renewal information, including a schedule of renewal fees, and required application forms can be found on NCCAP.ORG. 7. Submit renewal applications 6 weeks prior to your expiration date to allow for processing time. Renewal fees are due at the time of renewal application submission. Renewal applications received without appropriate forms and/or amount of payment are considered incomplete. 8. Notices of incomplete applications will be sent will be sent by email when discovered during initial processing and periodically thereafter up to one year from the expiration of certification. 9. Processing of renewal applications can be expedited for an additional fast track fee. 10. Certification status can only be given after review and approval are complete. 11. If your certification has expired for more than one year, you must submit a new application (rather than a renewal application) per current certification standards in effect. Activity Professionals seeking a Level Change need to complete a new application. The application will be merged and reviewed with the most recent previous application on file. It is not necessary to duplicate information already on file in the most recent previous application. Applicants only need to add additional information supporting the Level Change and pay the Level Change fee (see website for fee schedule). The expiration date of certification will remain the same as the most recent previous application. NOTE: If you seek a Level Change at the same time you are renewing, you MUST complete BOTH the Renewal Application as well as the Level Change Application and pay the associated fees.